The poor are easy to photograph. They make for good pictures, because they wear an expression of their many hardships literally on their sleeves. 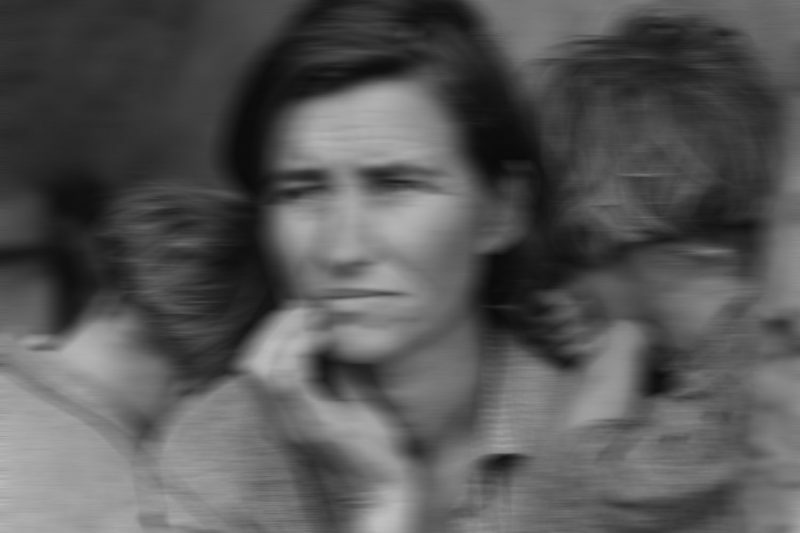 Unlike the well-off, poor people often lack an awareness of what a camera might do, specifically might do to them. And crucially, the poor don’t end up as patrons of the kinds of institutions that constitute large parts of photoland. In other words, they’re excluded economically, and they remain excluded symbolically as well, the frequent noises by fine-art photographers expressing concern about their plight notwithstanding. There is something profoundly wrong with this aspect of contemporary photography — not that the world of photography differs so much from the rest of society. After Trump won the election in 2016, reporters fanned out to Trump country to interview those who supposedly had brought about the entertainer’s victory. As studies have shown, reporters could have simply gone to any Republican household, but no, it somehow was another very specific segment of voters who had brought about this political upheaval. This approach has much in common with photographers taking to their cars or vans to find rugged subjects with beards who somehow always end up wearing tattered flannel shirts. This approach has a long history. On the one hand it idolizes these people — “common folks” who live in “the heartland” and somehow represent “real American values”. But it others them as well: no actual attempt is being made to see what “they” have in common with us, “us” here meaning the members of photoland. At times, such discussions bubble to the surface, never to be resolved (in fact, these discussions are more like a token that we photolandians care rather than that we actually want to fix things — they’re a form of kabuki theater). When famed and wealthy advertizing photographer Richard Avedon took to his station wagon to photograph In the American West, a review noted that many of his subjects “are dirty and misshapen in ways that are often associated with degradation and depravity, but sometimes also with superior virtue, and the few who are reasonably neat, clean and good looking usually seem, at least in these pictures, to suffer from a spiritual emptiness that ranges from solemn discontent to smug complacency.” Let that sink in for a moment. In his review, Gene Thornton continued “Avedon has, in short, brought to obscure inhabitants of the American West the same brilliant, perverse, theatrical imagination that he has previously brought to European and American artistic and political celebrities, not to mention fashion and advertising photography.” In a sense, this observation gets Avedon slightly off the hook as far as his portrayal of the denizens In the American West is concerned: at least Avedon was a photographic equal-opportunity abuser. After all, he did photograph the wealthy and famous, often turning them into grotesque creatures. Curiously though, and this gets me back to my argument, when there are discussions around this photographer’s work, more often than not it’s his portrayal of people in the American West that gets people riled up: these people aren’t the American West! How dare he?! Meanwhile, the celebrity photographs often get ignored, as if, given their background, they aren’t really photographs to be discussed. I think what’s really going on is not only the fact that the poor make such good photographic subjects. They’re also great subjects to project ideas onto — as all those reporters fanning out to Trumpland have been demonstrating: you go with a fixed idea in mind, and you then process what you encounter against the context of your own ideas and expectations. The poor make for very malleable material to do just that. The history of photography is filled with instances of The Other (The Other by Ryszard Kapuściński ought to be required reading for photographers), most notably concerning the colonial gaze. Expanding discussions around The Other to those living in our midst does not diminish considerations of, let’s say, how Africa was or often still is being portrayed photographically. If anything, such an approach acknowledges the source of The Other: it’s a question of power, of money, of privilege. Put simply, the poor in our midst have neither power, nor money, nor any privileges, and vast parts of photoland treat them accordingly. Of all the things they already lack, the right not to be portrayed as a group is another one. That’s a huge problem. It’s a problem because, as I already noted, it flies in the face of the frequent noises heard from photographers according to which they’re concerned about poor people’s plight. It’s very hard to make that argument in a white-cube gallery or art school when surrounded by only other privileged people, but I have actually been witness to such claims. Such claims don’t sit well with me. But not all photography necessarily happens in this particular environment, even though as far as I can tell, vast parts of non-art photography aims to become that, art: just look at how much documentary photography enters commercial gallery spaces or art museums, locations that are hardly known for paying more than lip service to many of the very ideas documentary photography is concerned with. Whether or not the problem I’m discussing here is resolvable I don’t know. In a sense, it isn’t: for art to be true art it will have to exist in grey areas. As viewers we need to be able to — and willing — to be faced with something that makes us very uncomfortable. For photography, this specifically means that the act of taking a picture almost inevitably will entail an element of exploitation, an element of an unequal power dynamic where one side, the photographer, gets to call the shots (pardon the pun; also, I don’t believe in the idea of collaboration when portraits are being taken: that just makes for truly boring art). Still, though, what’s uncomfortable about seeing poor people displayed the way they typically are? Aren’t we used to that? Almost expecting it? The key to all of this might not to have a discussion around how all photography is exploitation. Having such abstract discussions is good if — and only if — they’re tied to concrete proposals how to deal with the problem at hand (which they’re usually not). Instead, the question might be what the next step could be: given photography’s inherent qualities, how can problems that apparently are openly and widely known get solved? How do you, the photographer, resolve the problems you have created with your pictures? Can you, the photographer, even accept that your possibly good motivations notwithstanding your pictures compound the problem? I’ve grown especially allergic to claims by photographers that their pictures of poor people somehow are a reflection of their own state of mind: as if these people whose lives are hard enough now also have to serve as stand-ins for a bunch of (usually white male) artists with privileged-people problems! Poverty is not a life style — unlike (usually) being an artist. I don’t necessarily want to imply that this is a one-size-fits-all problem. There were and are photographers who seem to not only be aware of the problem but were and are working towards solutions. By solutions I here don’t mean the reduction, let alone elimination of poverty. While that is a very worthwhile goal it is simply too much to expect from pictures or photographers to be a part of that. At a more basic level, I’m here mostly interested in the imagery, in the portrayal, in how poor people are being treated photographically by the members of photoland. That is an aspect of this larger complex that we, the members of photoland, can control very much, and that we need to be able to openly discuss. To begin with discussing privilege is a good starting point. Privilege here splits into a variety of aspects, whether economical, gender-based (which shouldn’t exist but still does), racial (ditto) — these are the big ones that, again, are as difficult to control as poverty itself. Obviously, as member of a society we ought to have opinions about those. And then there’s the privilege of being able to understand what pictures do and how they do it. That privilege rarely gets talked about. But I think it sits at the core of where we ought to begin a discussion. This is, after all, where we are implicated as members of photoland. This is the privilege that we all have, even as we might differ concerning the other privileges. I have the feeling that there will be no easy solution to the whole problem. Photography inevitably will end up being exploitative. But without there being a counterpoint, an acknowledgement of what’s going on, without photographers at least attempting to counteract what they are doing with their pictures, no real progress will be made. The poor have been at the receiving end of photography’s exploitation game for too long — we owe it to them to put an end to that.